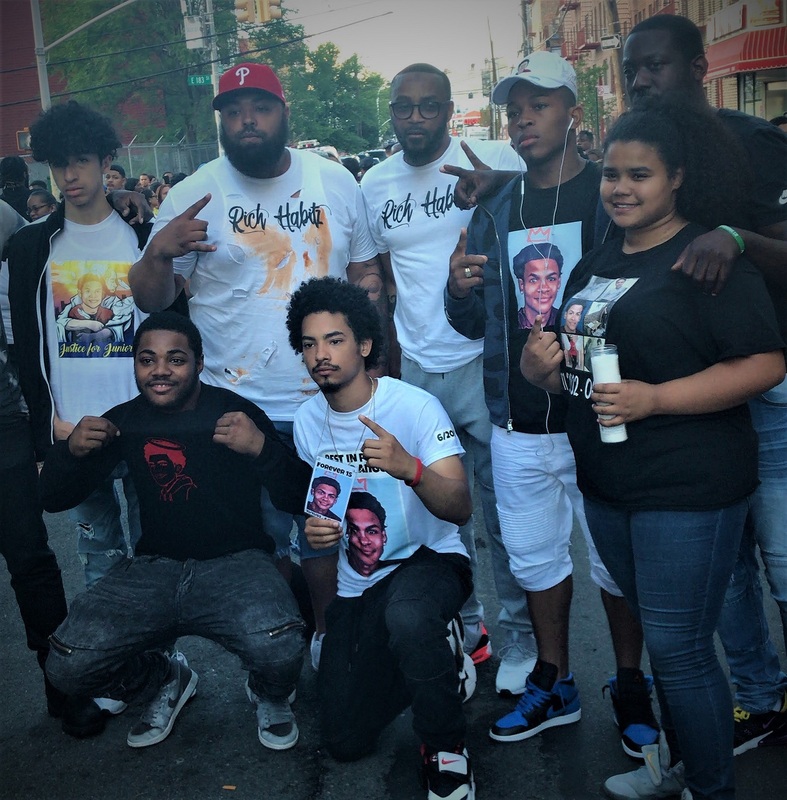 Gang murder in the Bronx: What do socialists have to say? These were the desperate cries of friends and family gathered around Lesandro “Junior” Guzman-Felisʼs blood-drenched body. Despite their hopes and prayers, “Junior” did not survive. He was officially pronounced dead on June 20 in front of St. Barnabas Hospital in the Bronx. 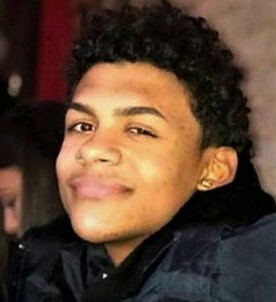 Lesandro ‘Junior’ Guzman-Feliz, age 15, was dragged out of the Cruz and Chiky bodega on 183 Street and Bathgate Avenue in the Bronx by five young men. In what seems to have been a case of mistaken identity, Junior was beaten, stabbed with a machete repeatedly in the torso and neck, and ultimately murdered by alleged members of the notoriously violent Dominican gang the Trinitarios. The vicious attack on Junior and his death were captured live on video and have gone viral. The young men involved in Junior’s murder are in custody and facing prison. The poor community of Belmont in the Bronx, and much of the city, is in deep mourning. Junior’s funeral was attended by over 1,000 people. 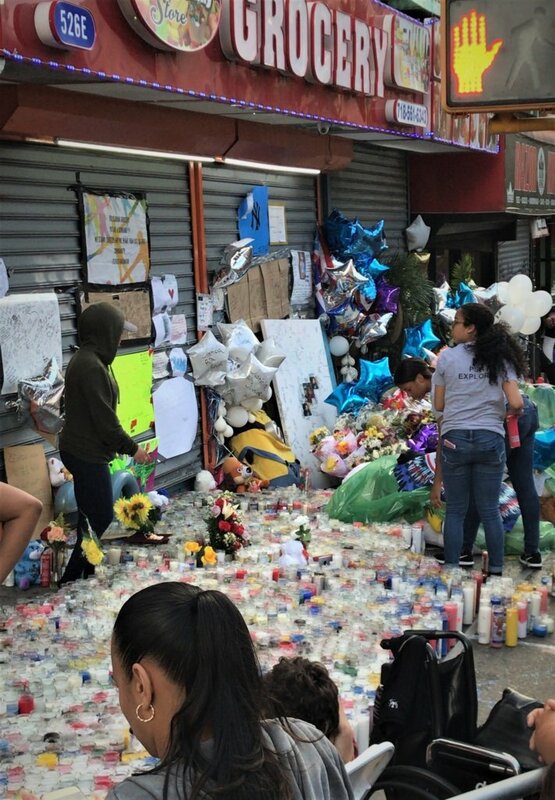 Hundreds still gather in front of the bodega, where the street has been turned into a shrine for Junior with hundreds of candles and posters, balloons, and personal notes posted in his honor. People gather to share memories of the deceased and to try to make sense of this tragedy. As more details emerge, as the media and the community continue to react, this tragic event has revealed profound contradictions. It raises serious questions about how to respond to such violent crimes—in this case an act of fratricide within a community—not the state killing an unarmed person, or a racist vigilante killing a young Black or brown boy—phenomena we are all too familiar with. Many of the facts are clear. This was a heinous crime. Many people are dead set on “justice for Junior,” meaning life sentences without parole for all five alleged gang members caught on video attacking Junior. That is probably the dominant view of people on the streets right now, and on social media. I heard it quite a bit when I went to Belmont to talk to community members a few days after Junior’s funeral. Based on the video footage they saw, people further blame the bodega owner and workers where the attack took place and are demanding the permanent shutdown of the Cruz & Chiky grocery store. Many people in the crowd said that the bodega manager knew Junior since he was an infant, and that he made a serious misstep in dismissing Junior, who was caught on camera desperately and repeatedly asking for help. Modesto Cruz, the store’s owner, has since gone public with additional video footage. Cruz said that he tried to hide Junior when he ran into the store to escape his assailants. Cruz said he was immediately on the phone with 911 emergency assistance. In the video where he is seen pointing at Junior to leave, Cruz said he was encouraging Junior to go directly to the hospital down the street because the ambulance he called had not arrived. Cruz also said that he doesnʼt know what else he could have done, as his life was in danger as well. New York Police Department Commissioner James P. OʼNeill held a press conference where he blamed Cruz. O’Neill said that, although the store owner did nothing criminal, “people have to be reflective on what their actions were, and maybe they could have done a better job.” Whether or not that is true, this is gross hypocrisy coming from the head of the racist, violent, militant gang that is the NYPD. From the many angles of video footage, it does appear that Junior was left to fend for himself until it was too late. He ran in his socks (his shoes were stolen) to a nearby hospital but died before gaining medical attention. One video that surfaced shows his last moments of life as he bled out, community and friends trying to comfort him, and yelling at the police for not showing up quickly enough. I interviewed Junior’s close friend Raphael, aka Nitro Fame, who said he knew Junior “since he was a baby.” Raphael was angry at the store owner, who he said “kicked Junior out.” Though this has not been confirmed, the general consensus is clear. Community members have hardened their hearts and do not forgive the bodega owner. All of this is an understandable reaction from the standpoint of personal justice. It is true that we must be reflective of our actions, but it is heartbreaking to hear the community so quickly and willingly blame other community members based on what appears to be selective footage. The community is also calling for life sentences for the young men caught on camera killing Junior. However, this will not solve the problem of fratricidal violence, nor will it cure the main disease that plagues Belmont and many communities in New York City and around the world—poverty. Belmont is the poorest neighborhood in all of New York City. The per capita income is $14,418. The median household income $25.053, down 2 percent since 2010, while rents go up. 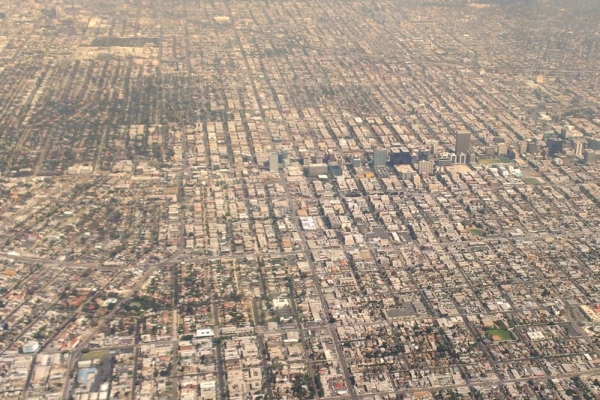 A third of the residents are immigrants in this largely Black and Latinx neighborhood. The incarceration rate is more than twice the city average. Examining the details of this crime from a socialist perspective takes patience, understanding, and deeper political analysis. Stepping back from the question of personal justice and what should happen to the men who killed Junior, one sees that this tragic and awful murder is already being used politically by class and political forces that have never given a damn about Belmont. Among them are forces demanding more policing. The police have taken advantage of this death, and are capitalizing on the fact that Junior was inspired to be a police officer. For them, it’s public relations. This community is already highly policed on a regular basis. When I was there, I saw two police officers stand guard at a pharmacy. In front of an African market, another squad car was posted, and many police officers stood guard during the tributes to Junior. Watching the news or reading the paper, you’d think that New York City is crime-ridden and dangerous, and gang members are running wild. In a city of 8 million, the media can always find something awful that happens any given day in an oppressed neighborhood. 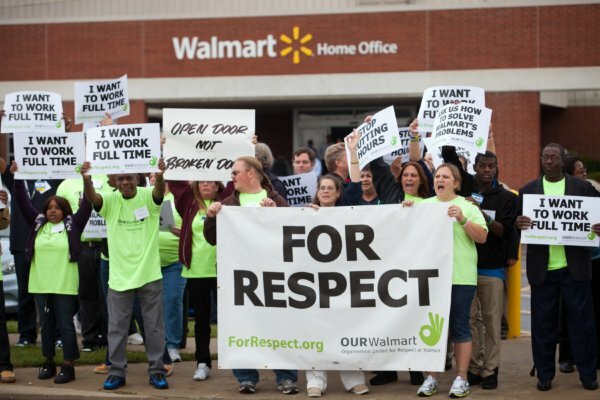 But the same media never highlight the solidarity, heroism and self-sacrifice of the working class that lives there. They want us to fear one another so much that we ultimately put all our trust in them. Days after the tragedy of Junior’s death, on the evening of June 28, in the very same community where this senseless violence ensued, a completely different story took place. 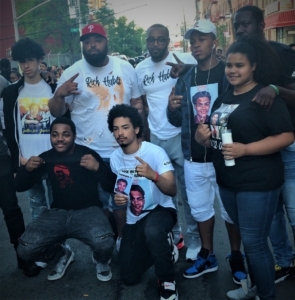 At 6:30 p.m., the community gathered at the shrine they created for Junior in front of the bodega, bringing candles and praying and sending their condolences to the family. Belmont is a vibrant residential neighborhood full of families and local businesses. Only 45 minutes earlier, it was pouring rain, but once it cleared up the streets filled with people. From the Grand Concourse to Webster Avenue and even right there on 183rd Street, daily life was positive. A hefty man in a bright polo shirt zoned out listening to Latin music a few blocks away in front of a local deli as a pickup truck adorned in a big bright Puerto Rico flag passes. Mothers still in their work clothes, contentedly pushed strollers, likely rushing to get home to prepare dinner for their families. Simultaneously, they were on the telephone, laughing, keeping up with the latest gossip. The barber shop chairs were full of young men in basketball sneakers, determined to stay fresh and clean, and young girls passed by wearing neat, vibrantly colored head wraps, likely preserving their hairdos for weekend festivities. Every diverse hue of skin reflecting the Latinx, Caribbean and African diaspora were represented in this minority community, and white teeth were shining in almost every passing gleaming smile. 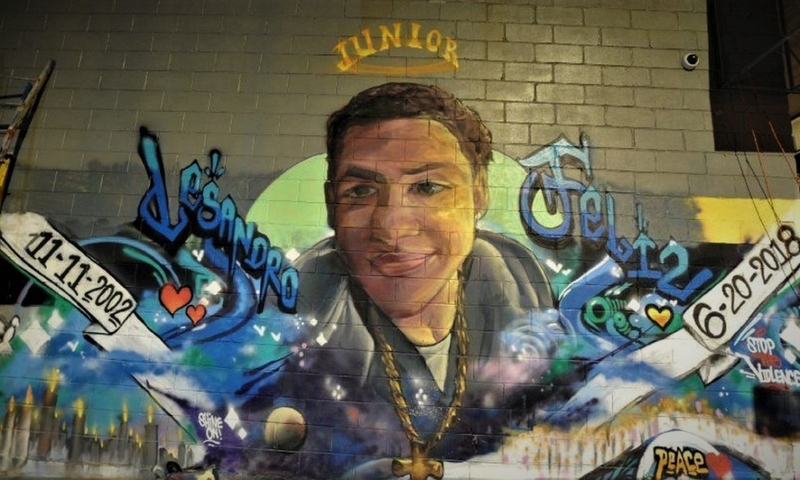 The stereotypical portrayal of the Bronx and of many Black and Brown, Latinx communities, is skewed when viewed only from isolated events such as the murder of Junior. New York is the safest big city in the U.S.
For instance, how many people knew that, based on national violent crime statistics, New York City is the safest big city in the United States? You would never know that looking at the news. So how under these circumstances, how does the NYPD, which is already bigger than the armies of some countries, continue to get billions of dollars in funding for its forces, equipment, surveillance, and so on? It does this by heightening fear and danger. Right now NYPD’s main thing is to highlight the “menace of gangs” to get young people into the penal system early. It does this by identifying young people of color as gang members, based on nothing more than friend associations, on what building they live in, or what they write on Facebook. “Under the banner of fighting ‘gangs,’ local and federal law enforcement agencies are conducting militarized raids that lead to harsh prosecutions of young people from poor neighborhoods of color—especially in public housing. More than 2,000 people were arrested in dozens of so-called takedowns in just two years alone, according to the NYPD. “Most of those arrested are vilified through the media before they’ve even seen a judge and never see trial as they’re pressured to take plea deals. Some young people have been swept up in indictments in large part due to the loose gang criteria, designed by police, that imply whomever associated with alleged “gang members” or wear certain colors are involved in a complex criminal syndicate. The development of these gang databases is really the latest in a steady stream of policing tactics that produced the mass incarceration phenomenon, strengthened the state, and weakened people’s organizations. From mandatory minimum sentences, to three strikes, to stop-and-frisk, each one of those tactics has been rolled out based on stories of horrible violence like this one—each one supposedly as a way to help the community, and even sold as a way to respond to a community’s needs. Mass incarceration did not come into the world by announcing itself as a mass incarceration. It grew out of policies that were sold as “responses” to violent crime. This is completely hypocritical. The U.S. government, as a matter of policy, endorses murder. The architects of dirty wars, coups and assassinations are not held accountable and are treated like national heroes. The U.S. legal and political system is committed to protecting the perpetrators of violence all the time. One killer cop after another gets away with murder. But “gang” violence in Black and Brown and working-class oppressed communities see the harshest extent of the law. Racist propaganda pumped out by Hollywood and the big business media portrays Black and Latinx youth as drug dealers, gang members and hoodlums. Never mind that the tactics and methods used in the drug trade are the same as those glamorized by the same media in movies like “The Godfather,” “Scarface,” “The Sopranos” and others where hustlers—like the Italian mafia—are portrayed as heroes and as people to emulate. Noting this flagrant hypocrisy is necessary but not sufficient to address gangs as a social issue within our class. For that, we have to look at several factors: the destruction of quality jobs; the alienation that leads so many young people to look for community in such organizations; and the violent patriarchal culture that drives so many men to unimaginable violence in some warped perception of defending “honor,” or gaining respect by killing people in the harshest possible terms. That’s where the role of revolutionaries and the movement must come in. The state will never solve the problems internal to our community. All the state ever does is increase its policing. The Black Panthers and Young Lords Party identified violent criminal operations as parasites in the community, but they organized to provide an alternative leadership to them. Most of the worst fratricidal violence took off in our communities based on the destruction of these and other liberation movements, which organized young people on a completely different basis, provided political consciousness about who the real enemy is, united people across all backgrounds and all blocks, practiced solidarity, uplifted women, and built combat organizations that fought for the people’s interests. At the shrine to Junior’s honor in Belmont, his Aunt Cindy was present, her eyes still puffy from crying. She was cleaning up the debris of the site to keep everything in order after the rain, and stated she needed time before speaking. I gave her space and watched as posters were reset and Lesandro Junior’s shrine and tribute was revived as if the rain never happened. Junior’s friends pose with rappers who had come to perform at the shrine. Photo: Elias Alicea. A rap performer named Gunjin and a singer named ReekRaw even did a song, which has gone viral on YouTube in Junior’s honor. My interviews in Belmont at Junior’s memorial were cut short as a motorcycle blasting music rode by, and a group of 15 people arrived holding signs declaring “Peace” to the community with dedications and condolences written to Junior. The community organized petitions, rallies, and got artists together for performances and commemorations. A lack of humanity is not the issue here. The inhumanity lies in the nature of this system. Under capitalism, with its individualism and violence, many of us become mere spectators to tragedies. Some of us absolve ourselves from helping those who need us. Others just don’t know what to do. There is another option. It is to build the movement that the young people and working class of the Bronx and the whole country need—a movement that goes beyond the question of personal justice and builds real solidarity in opposition to fratricidal violence, police violence and poverty. Such a movement can win real power for the oppressed.